Minimum interaction is required during use, sleek graphics and smart optics are completely non-obtrusive for front and peripheral vision making it the ultimate solution for use in fast-paced environments. Just like the dashboard of a sports car or the instruments of a fighter jet, our display provides performance-enhancing data, but only when you choose to view it. Safe, smart, fun...all wrapped up in the hottest goggle frame designs on the shelf. Is your favorite goggle brand Recon-Ready? 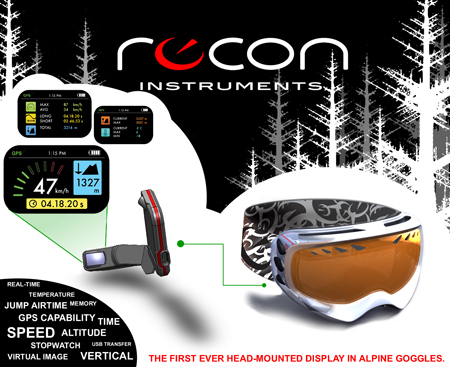 Recon Instruments is seeing more!